Another extraordinary live music night to be shared with you: With New Zealand's Estère and German-Brazlian YVY - we'll welcome two unique beautiful soul voices. Not to Mentorin ANNA LEEVIA, one of Berlin's grooviest DJ on the decks. We'll have a little release party at Father Graham that night! ? Yvy will drop her single and music video that day and celebrates the release with a special live show joined by her 5 piece band with the amazing jazz pianist Joel Holmes on keys, Kuba Guds on drums and Martin Buhl Staunstrup on bass and producer Simon on keys. As a songwriter, Yvy has a very unique and warm voice that catches the listener from the first moment on. The name Yvy comes from the Guaraness, an indigenous tribe from Brazil, and means the ‘furtile earth of paradise’. Her German and Brazilian ancestry lends a unique factor to her voice and lyrics that can be heard in her songwriting. Like a modern day mage with an ability to conjure magic from the sounds around her, Estère’s unique brand of Electric Blue Witch-Hop creates an unparalleled melange of music. Acclaimed as a rare performer of unique calibre, her catalogue for support slots includes opening for the likes of Grace Jones, John Cale, Flume and Erykah Badu. Referencing the meaty side of electronic music with thick bass atop weighty drums then contrasting it with organic acoustic textures - Estère bedecks her production with a rich elastic voice and punchy, ethereal melodies. 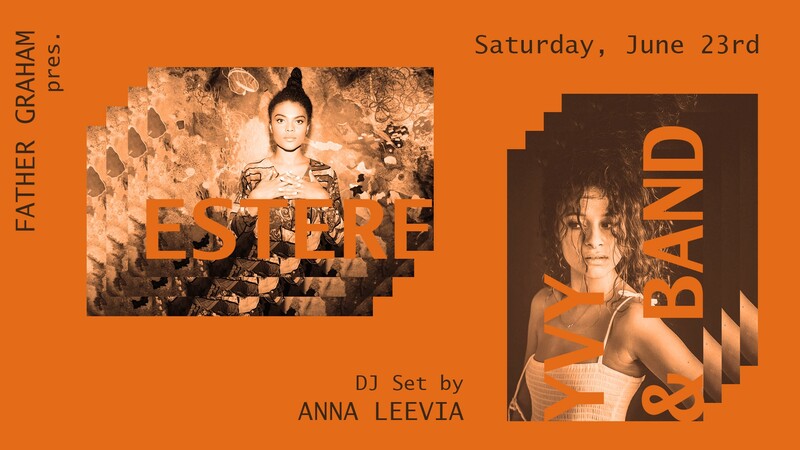 Groovy tunes from all over the planet will be provided by Anna Leevia - to round up a perfectly fitting line-up. Anna Leevia is against labeling her sound.